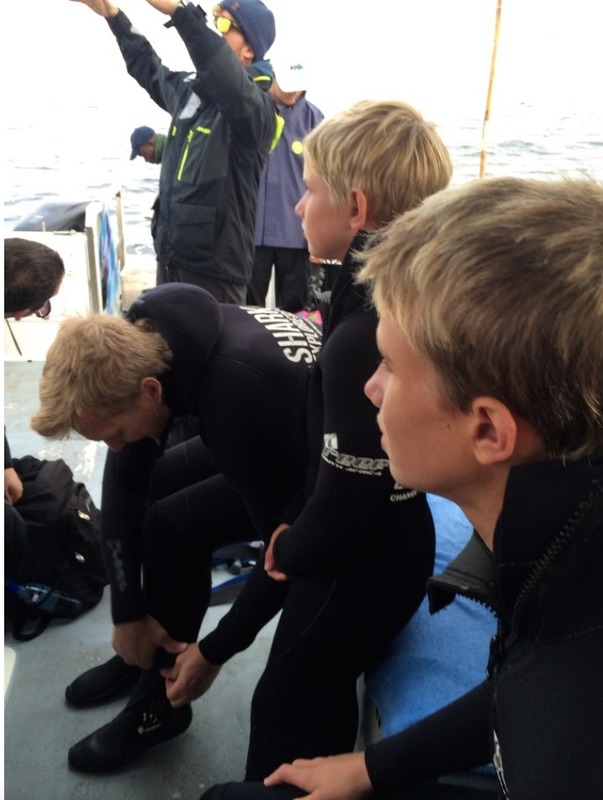 During a recent trip to South Africa, we debated shark diving. 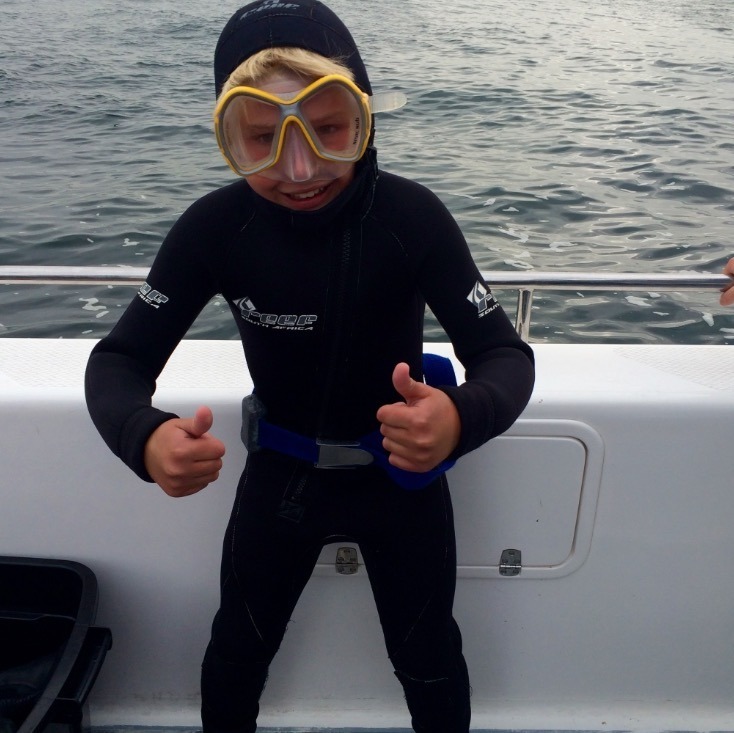 Both boys wanted to do it so desperately, yet the mom voice in my head said “are you f-ing crazy?” Regardless, at our family meeting, I was unanimously outvoted, and we had shark cage diving as a line item on our itinerary (gulp). We (they) felt if we were in South Africa, we just HAD to take this opportunity as this is where most of the shark footage for shark week is taken. 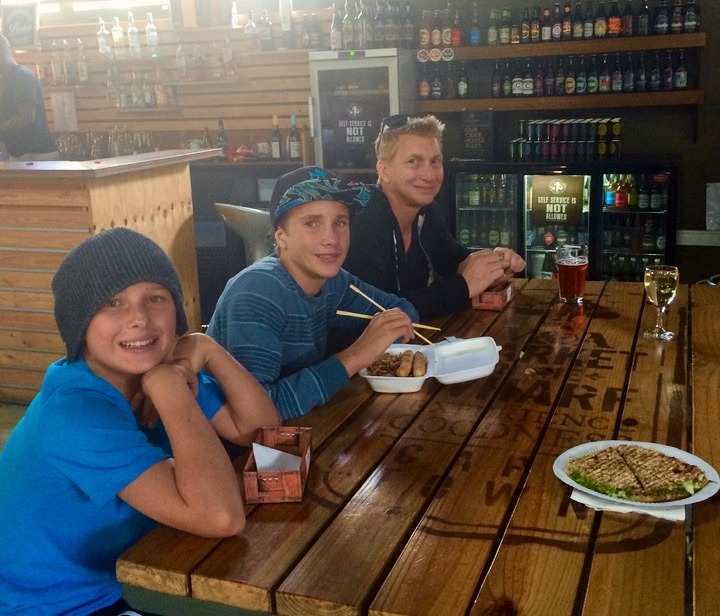 This was a complete bucket list experience for us all, and to experience this as a family was incredible… was it scary as heck…. YES! Would I do it again? 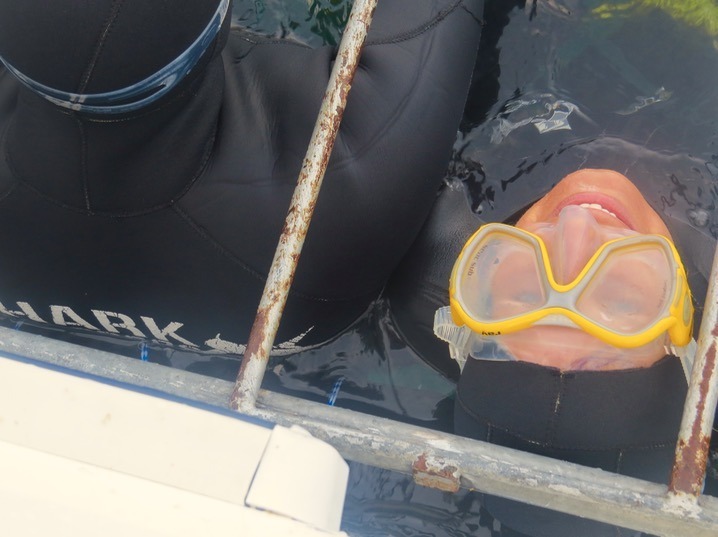 Probs not… but I’m so glad I took the plunge into the ice cold bay in Simon’s Town, South Africa (literally… I have pics to prove it)! Here we are at 6am, signing our life away in waivers! 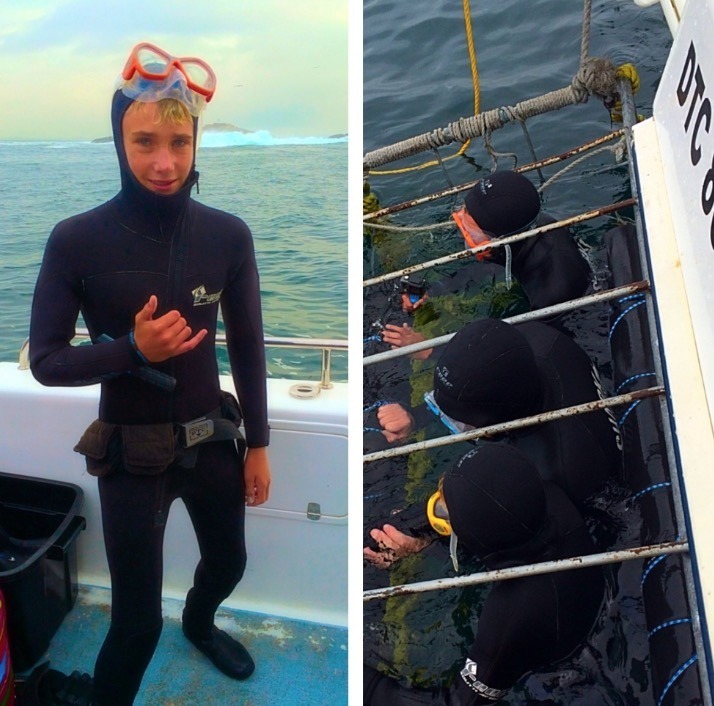 There are many operators out there offering to take you shark cage diving. Choose wisely. 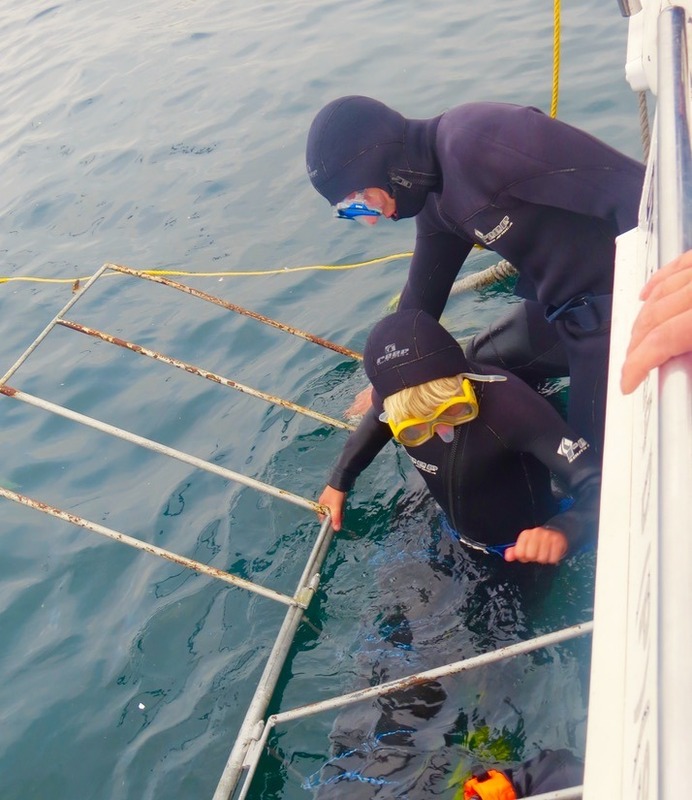 Some shark cage diving operations are better than others, including better safety records, better practices, and better cages. 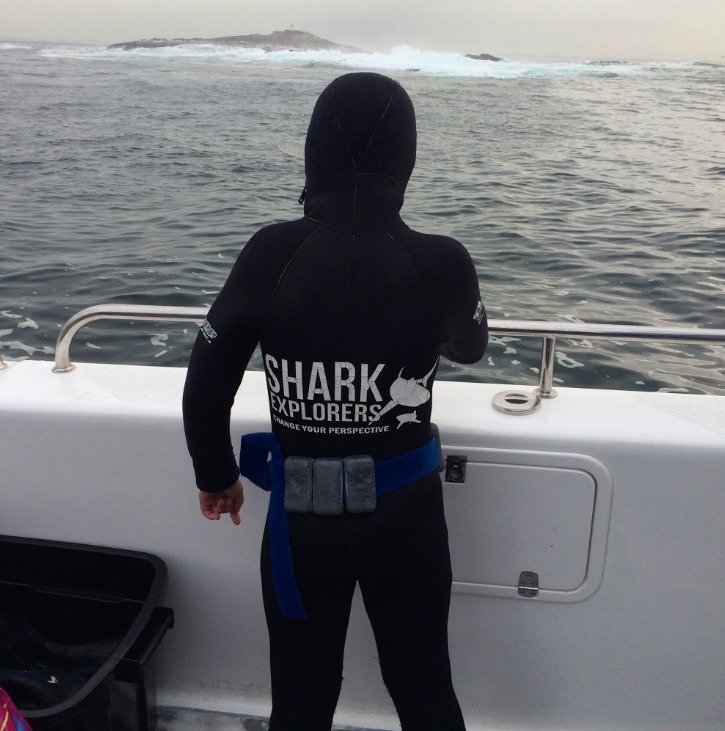 Before you pick a boat, ask lots of questions such as: “how long will I be in the water with the sharks?” and “are you a licensed tour operator?” Trust me, this is not an area you want to try and save money on for obvious reasons! 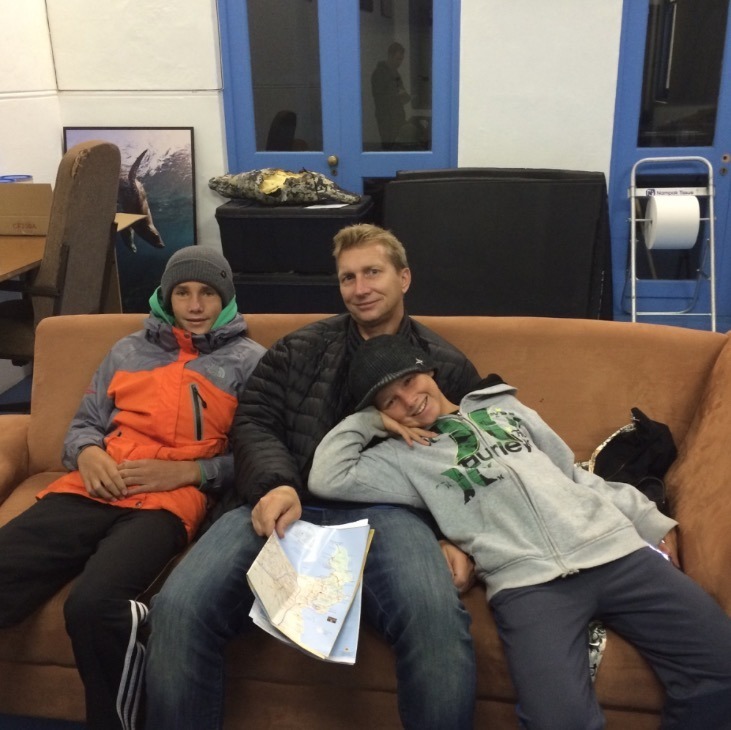 We left our Cape Town hotel at 5am for the 45 minute drive to Simon’s Town Pier and were met by the crew at 6am for a briefing and 7am departure. They wanted us there nice and early to sign the mountain of waivers (shocker). The woman passing out the legal paperwork had a great sense of humor about us signing the waiver discussing losing limbs or life. 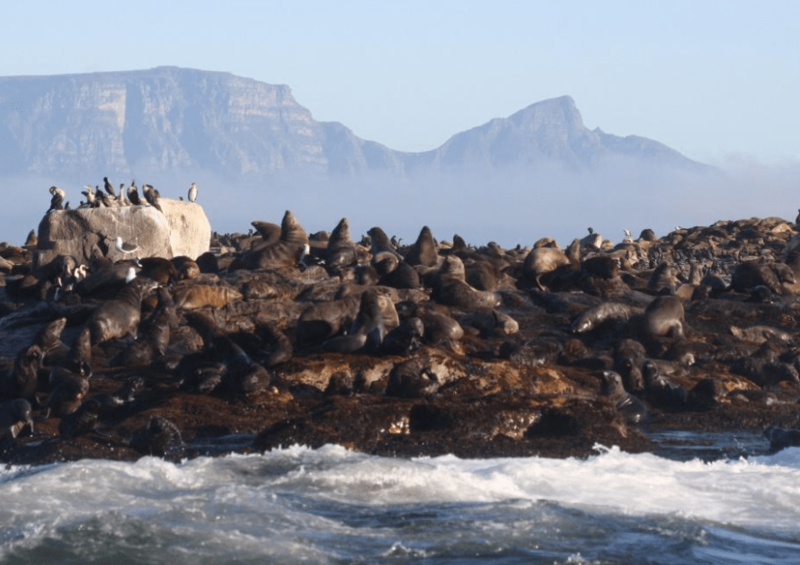 Early morning is when the great white’s natural predatory interaction with the Cape Fur seal is most active and they want to do everything possible to secure a sighting. Once we were on board we received a boat safety briefing and a short introduction on the Great White Shark hunting behavior. The waters are very very choppy, bordering on terribly rough. 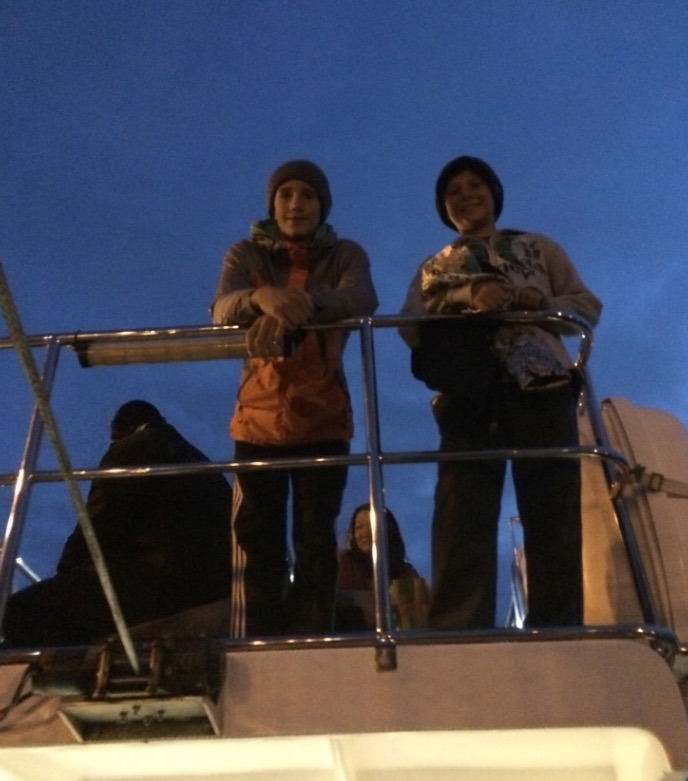 The timing of the boat trip varies depending on the sea and weather conditions. Strong seas and/or strong headwind conditions can lengthen the travel time considerably. You drive about a half hour from Simon’s Town Pier to Seal Island. 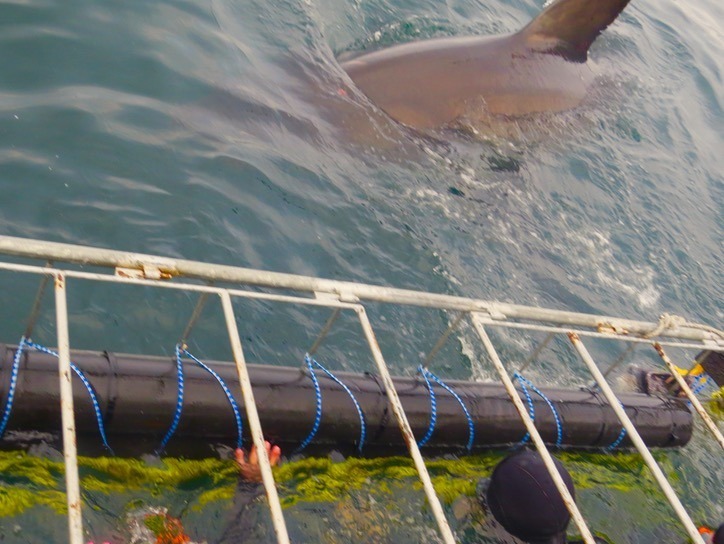 The crew then anchors the boat for about three hours for cage diving and shark and seal viewing near Seal Island (be warned of the smell – it is overwhelmingly ripe). Seal Island was incredible to see. There were thousands of seals all in one spot. They only go in the water when they need food for fear they will be eaten by the sharks. 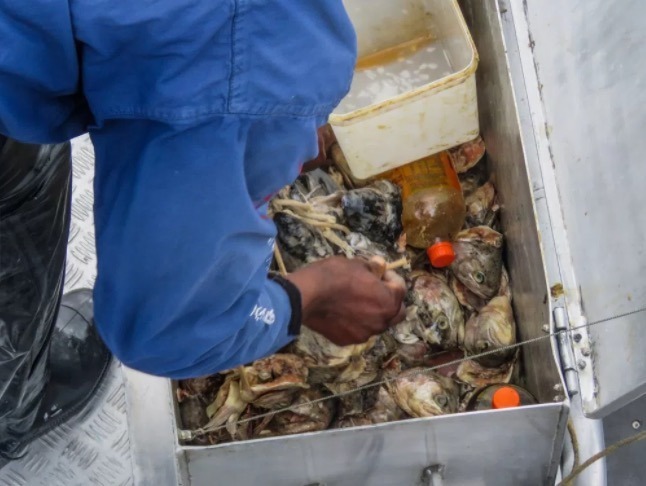 As we left the dock, we watched a crew member open up a huge plastic container of fish heads and body parts. He then added about a gallon of sea water to the container, fish oil, put on his wellies, and began to pound the fish parts with his feet. Not gonna lie, the squelching sound and crushing of the fish heads was not helping my sea sickness one bit. The smell of rotting fish filled the boat, the sound of squelchy fish heads rang in our ears, as we drove the boat to the optimum shark viewing area. The fresh chum is gradually thrown in the sea to create a chum slick. 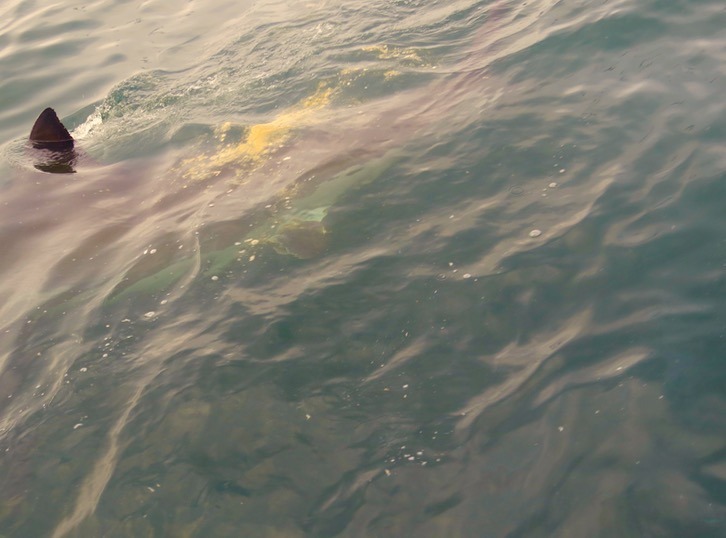 The chum slick mimics a carcass of a dead Tuna and the sharks love to eat this. 5. 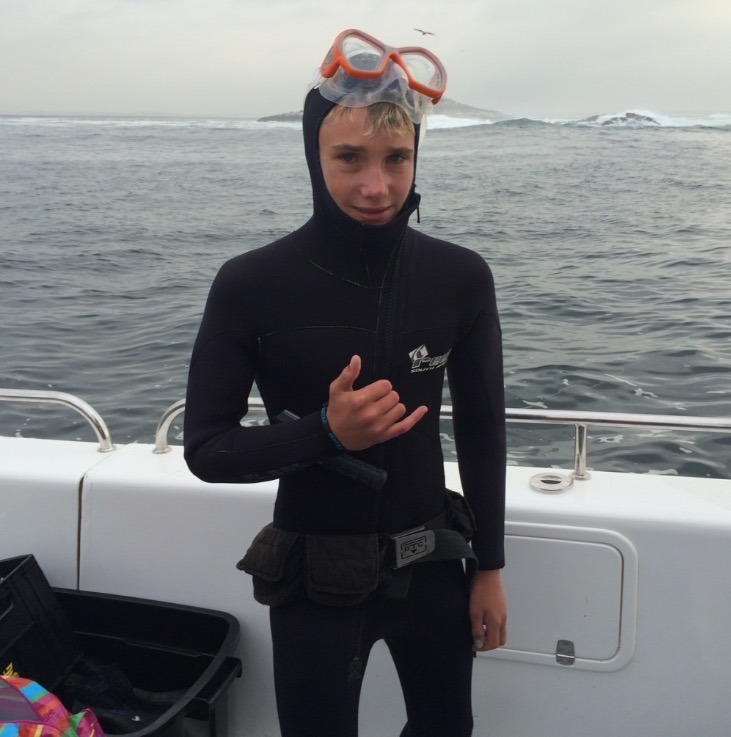 Do not think about who wore the clammy wetsuit the day before – just go with it! 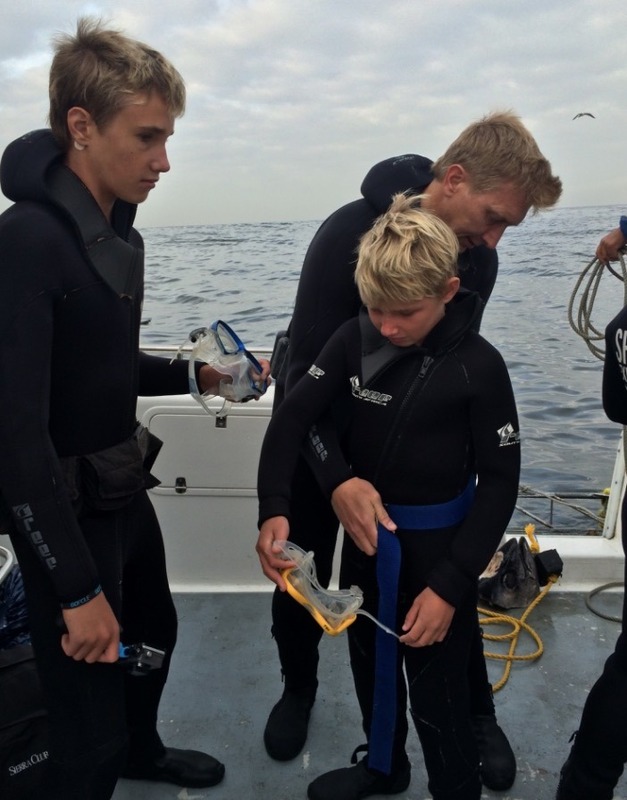 All the diving gear you need is provided, but bear in mind they take two boats out per day. There’s a stack of wetsuits, and you scramble to find your size from a damp, smelly pile. The water is about 50 – 60 degrees, so barebacking is not an option. 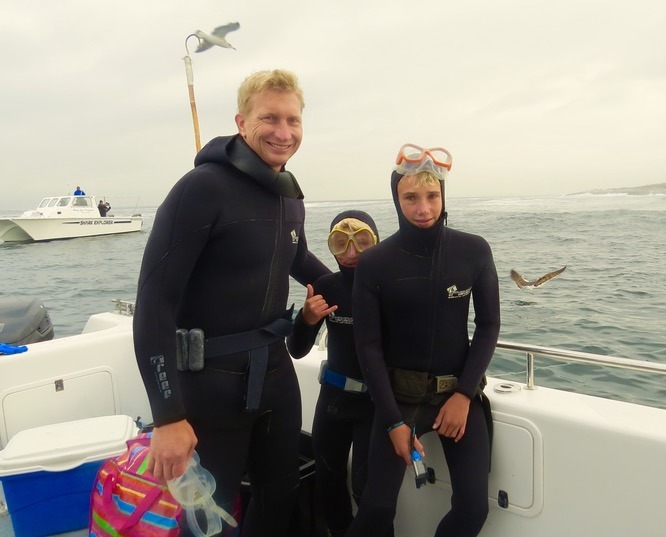 Although this is Africa, on a warm day, the water ranges from 50° to 60° F. You are pretty damp if not soaking from the minute you leave the dock to the minute you return, from sea spray and getting in and out the damp wetsuits. Couple that with the strong winds and choppy waters, you feel cold very quickly. Add sea sickness to the equation, and you can be feeling very miserable very quickly. This is the number one reason the boats turn around and these tours are cut short. See where you secure the top flap to the cage to keep it closed? No… neither did I! I personally think that cages is a misleading term. When I think of a cage, I picture being securely locked in from the top, bottom and all four sides with a nice sturdy lock to hold everything in place like Houdini performing that famous trick underwater. Now lets talk about the shark diving cages. See the lock on the roof? Nope… neither did I.. there isn’t one! It’s about a 3ft x 6ft cage with about 10 inches of space between each bar. The lid is a loose flap that sits on top of the cage when you are submerged. No lock to secure the top at all. 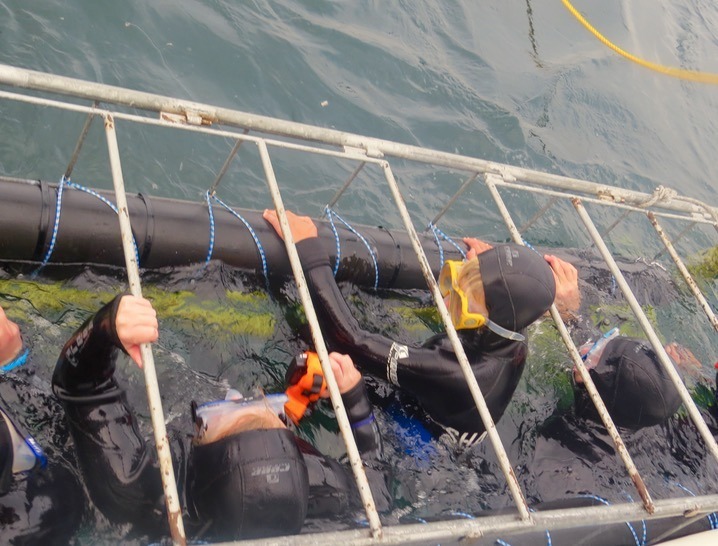 There is a rail at the bottom of the cage to stick your feet under to help keep you underwater. 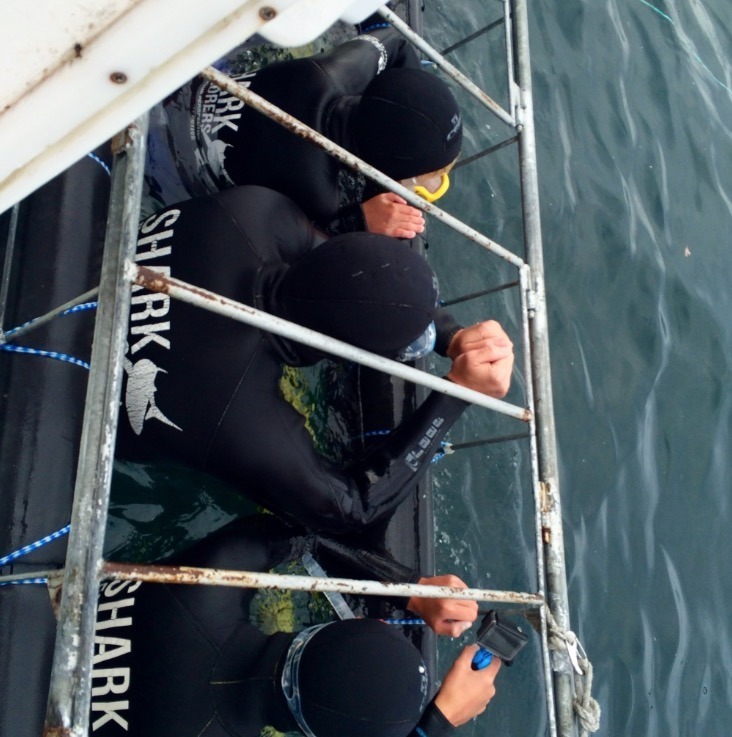 Three to four people hop into the cage at one time, and the other people wait for the next cage and view the sharks from the boat. 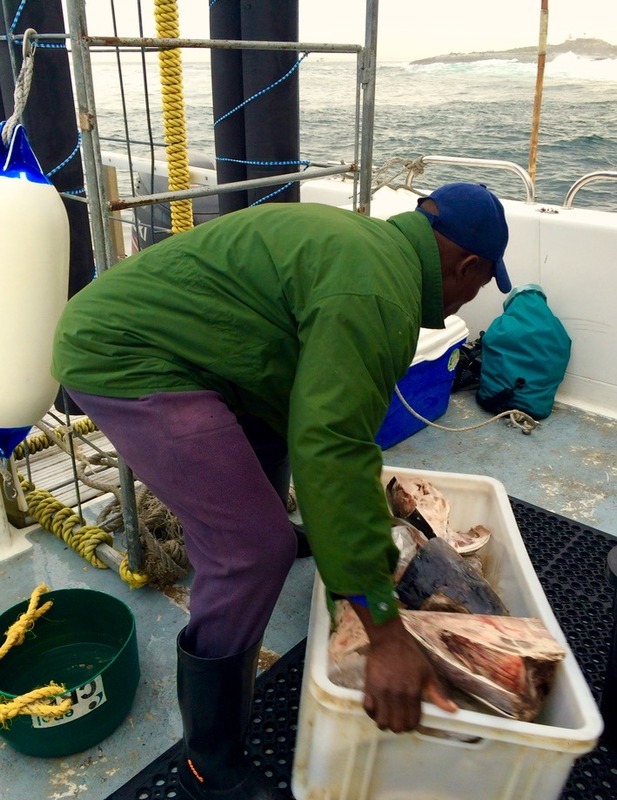 The boatman smears the cage with chum, spreads chum in the water around the boat, and patiently waits for a great white to take the bait. The cage is tied to the side of the boat, and about 12 inches of the cage floats above water at all time. 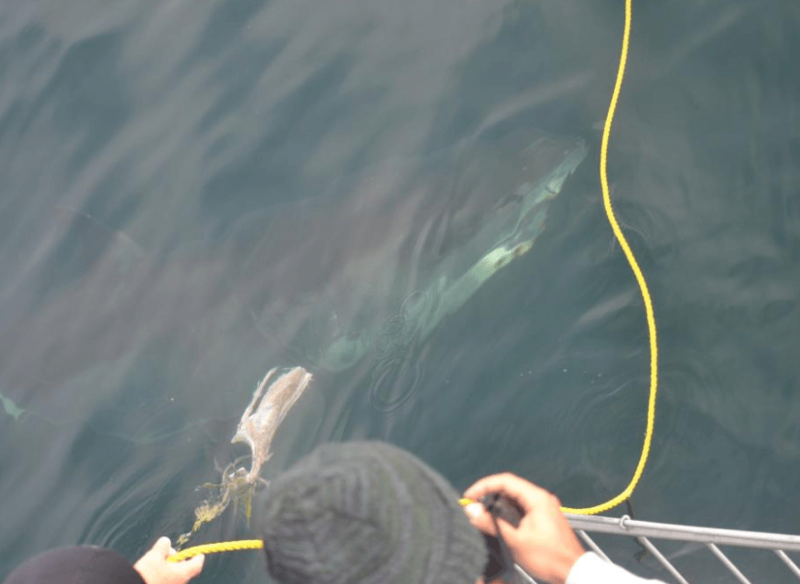 The boatmen are trained to spot and lure great whites with chum. 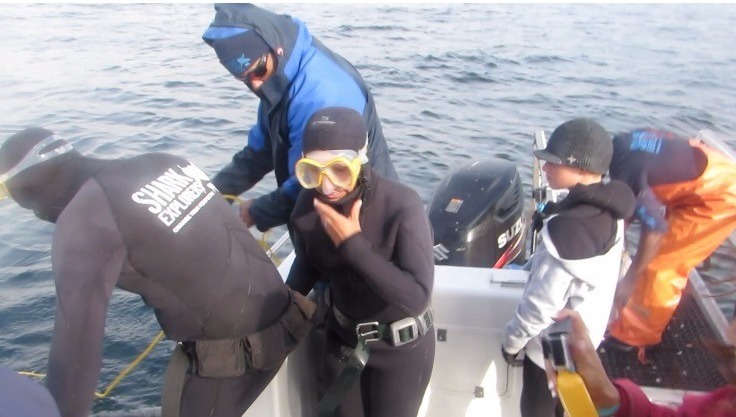 When they spot one approaching they yell SHARK (obvi) and the people designated for that cage jump quickly into the cage, as it is quickly lowered into ice cold water. When the guide yells “down,” you go down quickly. At this point my heart is beating out of my body… it was too late to wimp out… I was going in! All the time you’re watching a massive shark fin head towards you. The cage sits about 12 inches below the surface of the water and you take a huge breath, use the cage bars to hold yourself underwater, and stare at the great white swimming toward you. You don’t dive with scuba equipment as the sharks are scared off by the bubbles. The water is ice cold, the top of the cage flap is not locked, and your adrenaline is pumping. 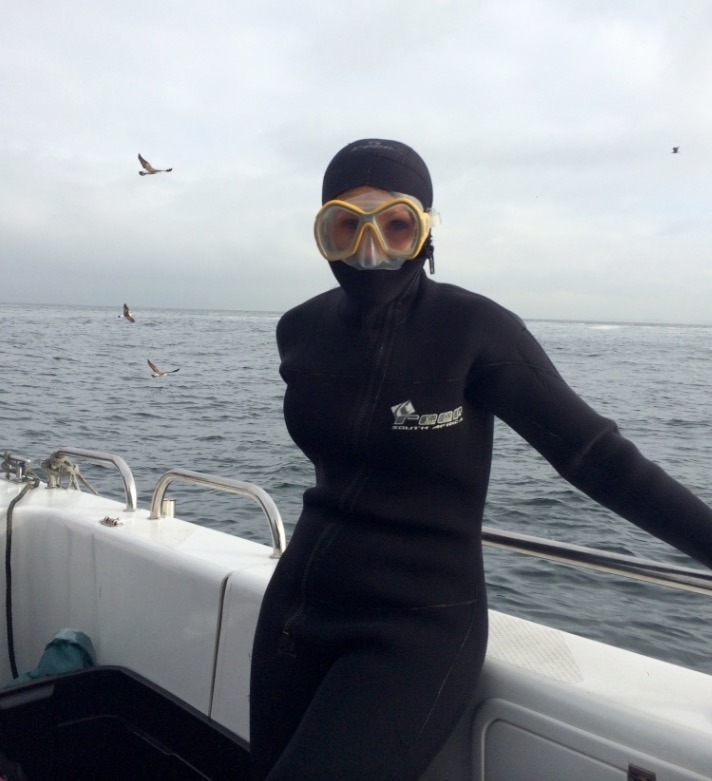 I’m not gonna lie, I about peed my pants (or wetsuit which relates to an earlier point about the gross wetsuits). 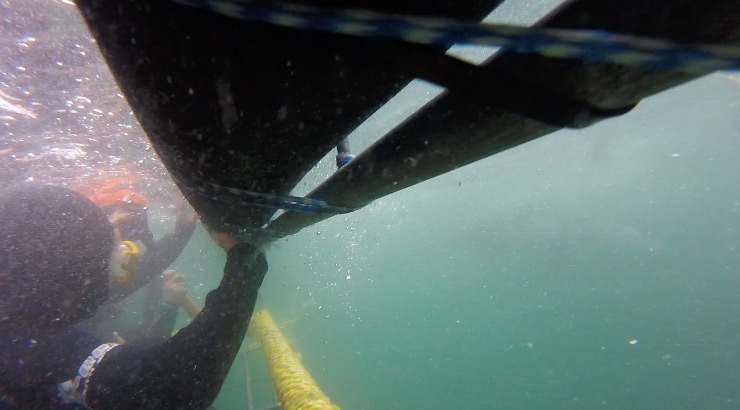 The water was freezing and filled with fish guts and blood, fish parts were floating in the water around me, jellyfish floated into the cage next to my face, and I was scared as heck just trying to hold my breath! 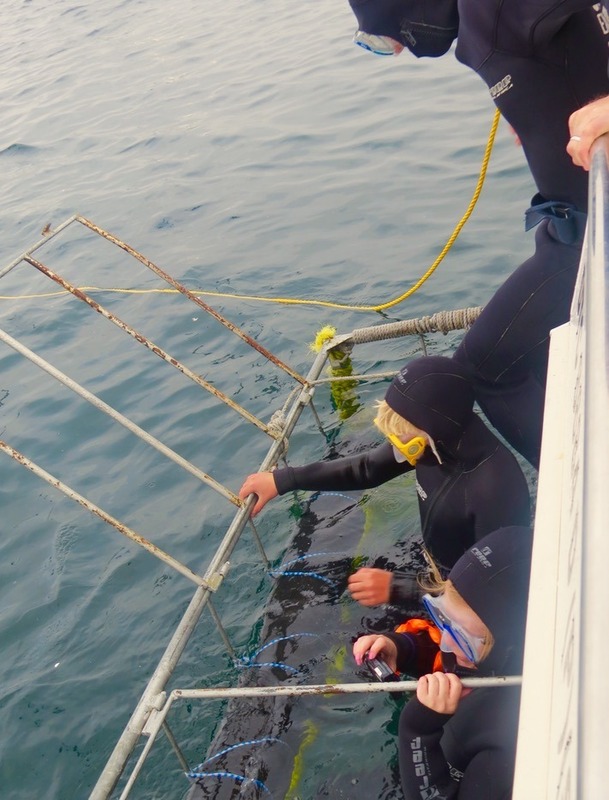 The crew have been doing this for a while and know what we’re there for, so they rub chum over the cage to lure the great white as close as possible. There was about 12 inches between my eyeball and the sharks eyeball. Seriously my heart is racing just writing this. You spend about 20 – 30 minutes in the cage, viewing the sharks, depending on activity and your tolerance for the ice cold water. I confess after about 30 minutes I was starting to feel violently ill and freezing cold. The smell of rotten fish was awful and after swallowing a bit of salty water (filled with fish guts and blood) my nausea became more intense. The boys hopped in the first cage with Hot Hubby, (truth be told I hadn’t 100% decided I was going down). When they yelled “SHARK” and my boys hopped in, I was ready with my camera. 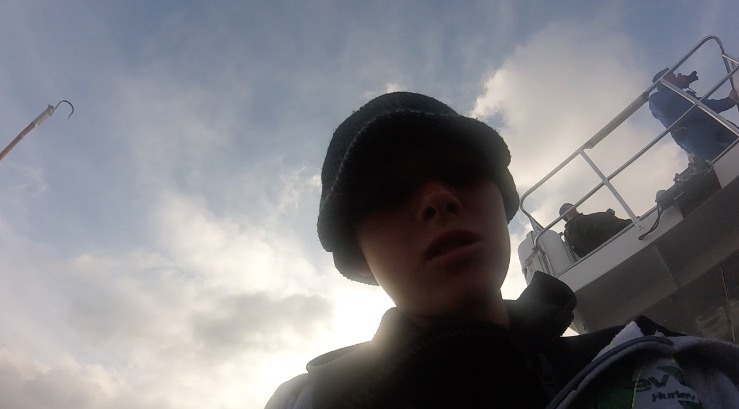 Julian grabbed the bars with his little fingers as they were lowered down in front of an inbound 13 ft great white looking for food. “PULL YOUR FINGERS AWAY FROM THE BARS” I yelled, as they plunged underwater. I was reassured that the sharks don’t usually eat the fingers, but all I could think about was that freaking waiver that I signed 3 hours earlier. They were down for about 45 seconds as the shark bumped the cage with its tail looking for food, then just as quickly as it arrived, it swam away. “THAT WAS SO FREAKING AWESOME!! !” yelled Julian, as he came up for air. 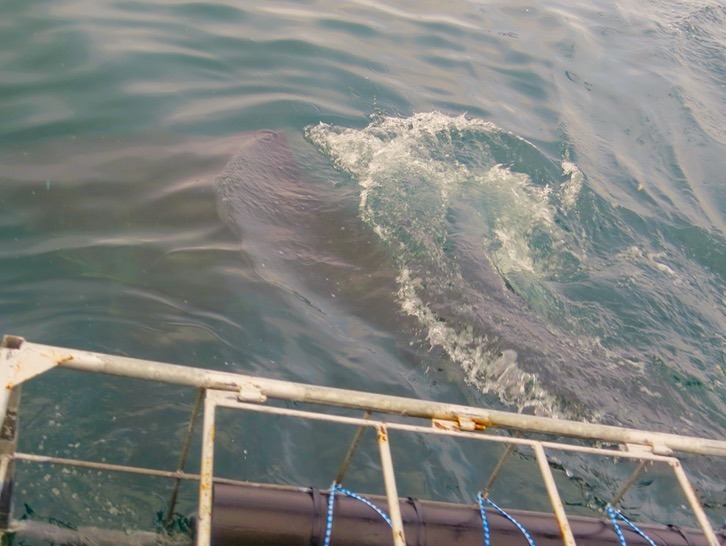 There is so much happening on the boat when a shark is spotted, I’d suggest giving your camera to someone who has chickened out of going down in the cage. My three boys are in that cage! Julian’s fingers look like shark food to me! Seeing a shark up close and personal in its natural habitat, was the most insane rush of adrenaline we have ever experienced together. We were face to face with one of the most beautiful and deadly creatures in the world. We had a front row view to every row of teeth, and we were close enough to see the bits of fish stuck in between them. Sharks have the most intelligent eyes. You can see them checking out the whole situation and eyeballing their prey. After we arrived back at the pier, we put on warm clothes, we were no longer throwing up, and we sat for fish and chips. We could barely believe what we just did! It was so freaking incredible! 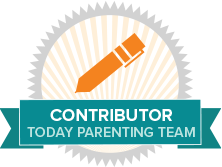 I wouldn’t say it was the most wonderful and fun experience ever, but it was by far the most heart thumping, exhilarating and challenging adventure together, and we were all so proud that we all managed to check this off our bucket lists… even mom!